The first day out on the road with “Sally” needs a bit more of an explanation than was offered in the previous post. You see, nothing about my new life in France is as easy as it seems. As you may remember from this summer’s blogs, my friend Geoffrey kindly loaned “Ales”, the tattered Citroen, to me for road trips out of Uzes. Sadly for him, he mentioned I might get to use his red Mustang with racing stripes when I returned in the Spring. 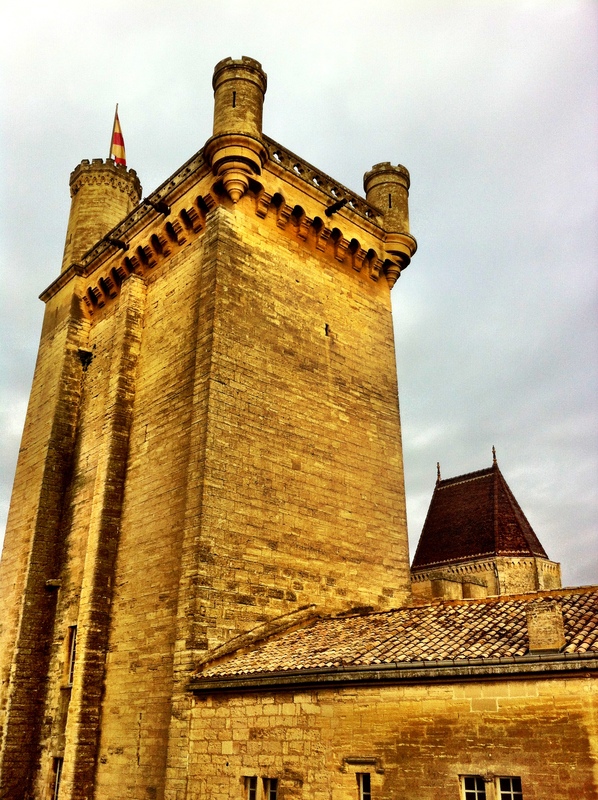 Arriving back in Uzes, I reminded Geoffrey of his offer. Often. Finally we worked out a “loan” agreement. Geoffrey had stuff in his house he want to sell and I wanted stuff for my new apartment. I wanted a car, he had more than one. It seemed to be working out great for both of us. Sally has an interesting background. Before I go on, let me tell you about Sally’s past. She was given to Geoffrey by a wealthy man who owned her. He also bestowed to my friend another almost identical Mustang. They both are red with racing stripes. One difference between the two cars is the size of the engines. Sally has four cylinders, her twin has six. The other difference is that the Sally’s twin Mustang is being held hostage. Whereabouts unknown. Part of my loan agreement for Sally was that I would help find her twin sister. That meant going with Geoffrey to a meeting with the “bailiff” to sort out the issues surrounding the missing Mustang. On the day of the meeting I walked to the bailiff’s office by myself. It’s in a two-story building that shares a driveway with the second-hand store I’ve shopped in a lot, so I knew where I was going. 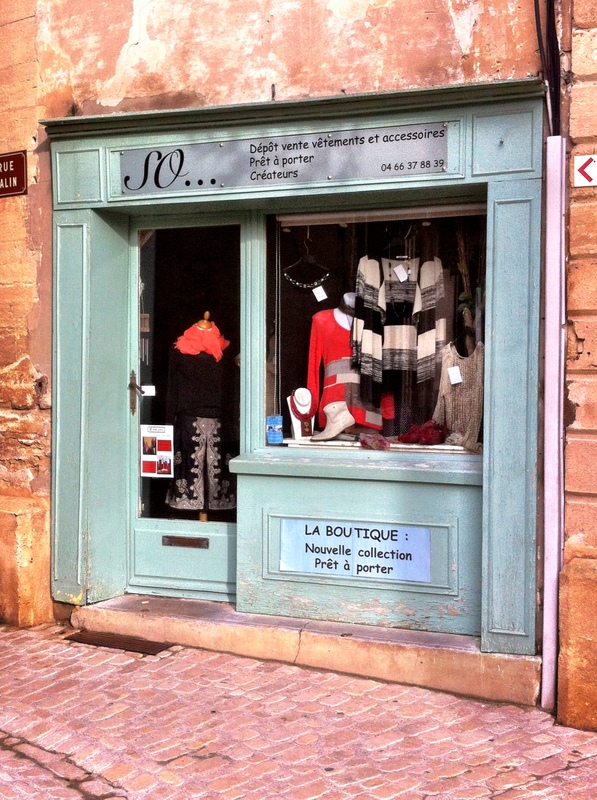 I had noticed the open-staircase structure the first time I visited the “brocante” store. Its architecture is totally out of character in this French provincial town. It looks like a 1970’s-style motel. Before I got far down the driveway, Geoffrey called to me from the balcony of the building’s second floor. I walked up the metal steps and into the open door of the office. Strangely, I felt like I was on the film set of an Alfred Hitchcock movie. It was all a bit “shady” — the surroundings and the people inside. Rather than spoil the plot for a great mystery novel, I stop here. Let’s just say we thought the deed was done. The visit to the bailiff’s office was three weeks ago. Still no word on the missing car. So last week, tired of waiting to get on the road, I told Geoffrey I was taking Sally. In fact, “she’s staying with me from now ’til April”, I announced. He agreed and handed me Sally’s keys. We were off. Stopping at the nearest gas station to fill her up, I pumped petrol into Sally’s empty tank. I just had to pay for the gas and we’d be on our way. The lady behind the register at the gas station started ringing up the sale. She looked outside at Sally. She looked at me. Instead of handing me the reader for my credit card, she pulled a slip of paper out of the drawer. An unpaid bill for 95 euros. She politely announced she was calling the police. Now, picture this. 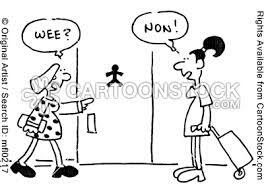 This discussion is going on between me — who speaks no French — and a lady at the counter who speaks no English. Fortunately a couple of men waiting in line were able to help translate our conversation. Quickly considering my two choices:1) run, or 2) or pay the bill. I handed over my credit card to pay the 95 euros. Starting off my three-year adventure in France with an encounter with the French gendarme isn’t exactly in my game plan. Later, returning to Geoffrey’s to re-negotiate the terms of the loan of the car, we now have a new agreement. Sally’s mine until June. You see, before I adopted Sally, she was in an accident and a burglary. When her radio was “burgled”, the robber came through the driver’s side window. Now the window won’t go up or down. That means every time I come into or out of my gated, underground parking lot, I have to put on the emergency brake; open my door; wrench my body around to swipe the parking pass on the automated “eye”; hope the garage gate will open; close the car door; buckle the seat belt; release the brake; then take off. As a result of the accident, Sally is sporting a spare tire. 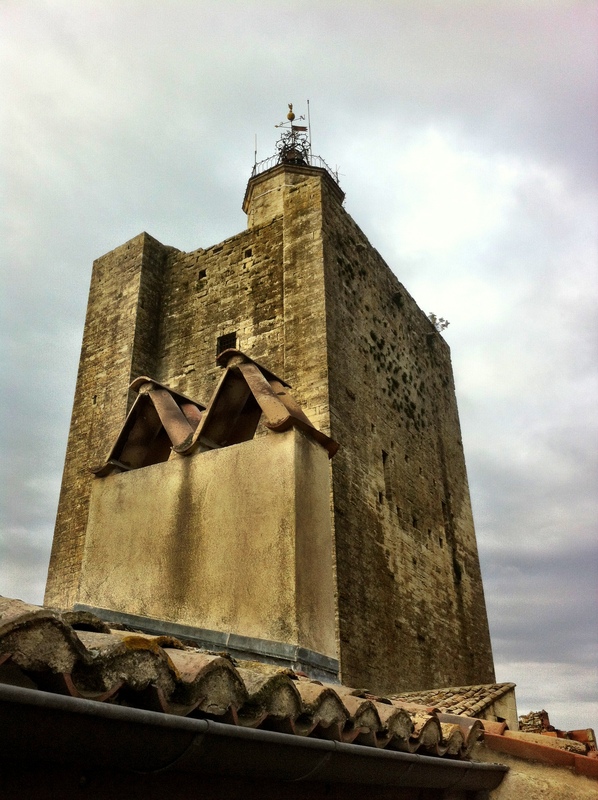 That takes us back to the story about the trip to Saint Jean du Gard. Sally and I were raring to go. Admittedly, I was a bit concerned about taking a trip — albeit only 45 kilometers away — on a spare tire. Fortunately I ran into my friend Andy on Sunday. 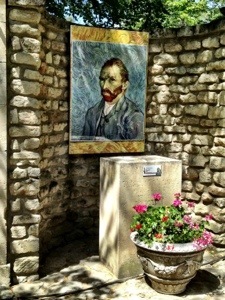 He had gone with me a few weeks ago to pick up my shipment of boxes from Marseilles. He offered to take his van on the site seeing trip, instead of taking a chance with Sally on the road. Stubbornly I stuck with my plan to take her for the drive. 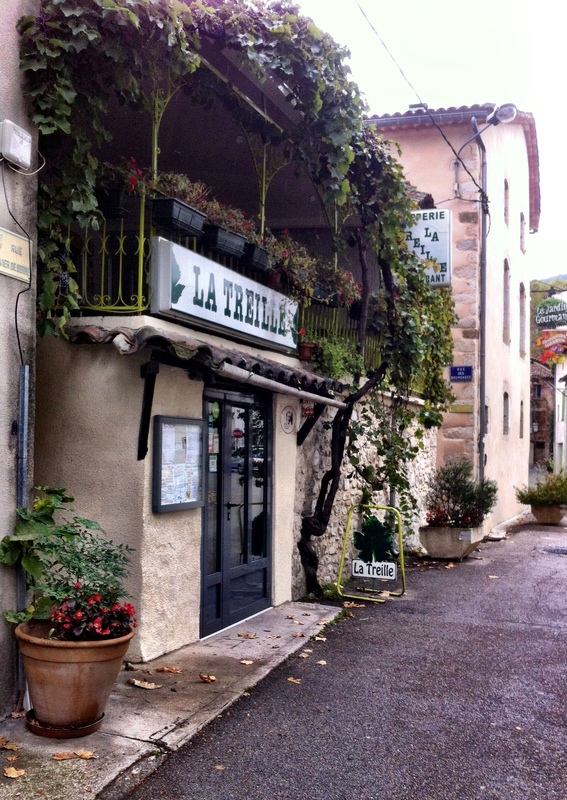 Luckily, there were no car mishaps along the road to Saint Jean du Gard. Andy knew he was indispensable as my road mechanic and he took full charge, giving road tips and warnings to slow down. Sally handles like a dream. 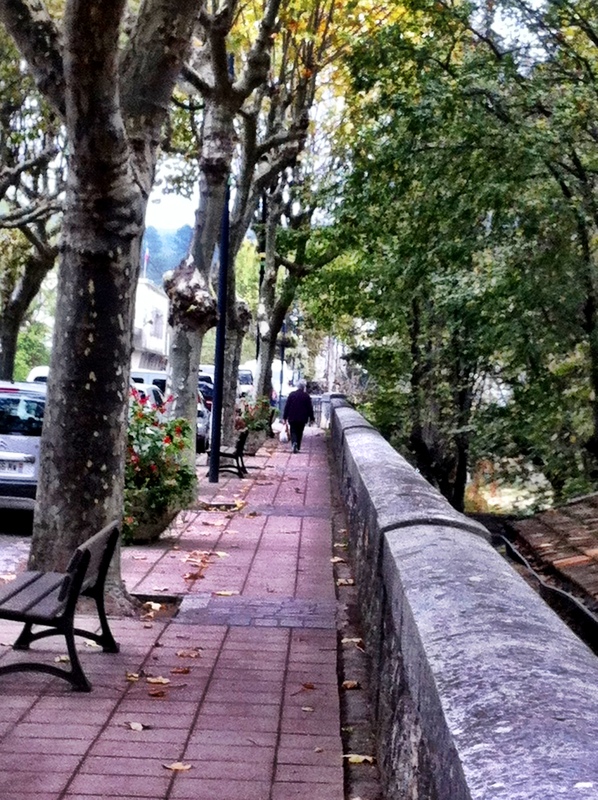 She hugs the narrow, curvy, back roads of France like a born racer. Just wait ’til we get her “big girl” tire. 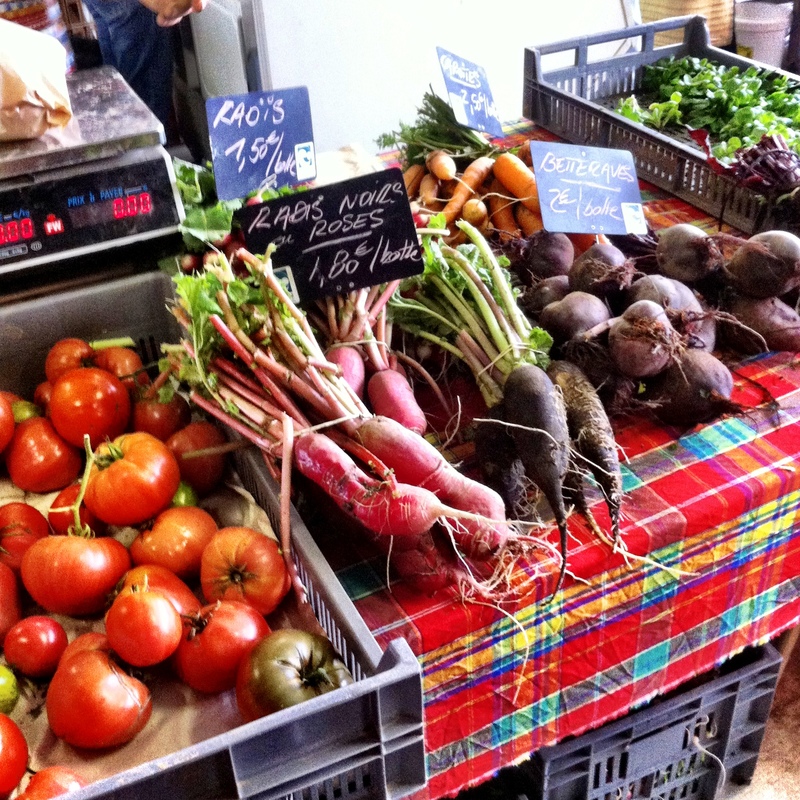 Sally’s first road trip was to the Tuesday market in Saint Jean du Gard. The town’s history dates back to the twelfth century when monks from the Abbey of St-Gilles created the settlement on the banks of the Gardon River. With its religious beginnings, Saint Jean du Gard and the surrounding area — the Cévennes — became known as a stronghold for French Protestants (Hugenots). The citizens, mostly white-shirted Calvinist peasants (Camisards), famously banded together to fight royal control throughout years of religious wars. Many fled to America, England and Switzerland from 1685 into the early 1700’s to avoid ongoing persecution. More recent history of Saint Jean du Gard includes the town’s mention in Robert Lewis Stevenson’s Travels with a Donkey in the Cévennes. Apples everywhere. All varieties and juices galore.Many types of apples are the same as in the States. Only a few I’ve never seen before. In addition to the raw apples, there are several versions of apple juice. Not being a big fan of fruit juices, I didn’t buy any to bring back with me. Nevertheless, it makes a great photo. Also in season are chestnuts. While doing a bit of research on Saint Jean du Gard, I learned that chestnut trees were once an important food crop and brought a degree of wealth to the area because of the popular “marron” nuts. When planting mulberry trees to “nourish” the silk worm industry became more profitable than harvesting chestnuts, mulberry trees took over much of the landscape. 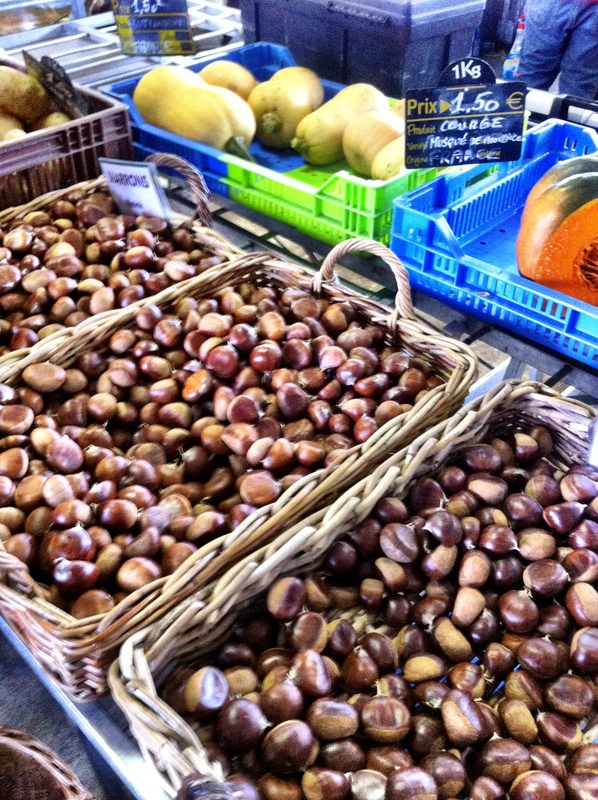 Fortunately marrons are abundant enough in the markets today for all to continue to enjoy. 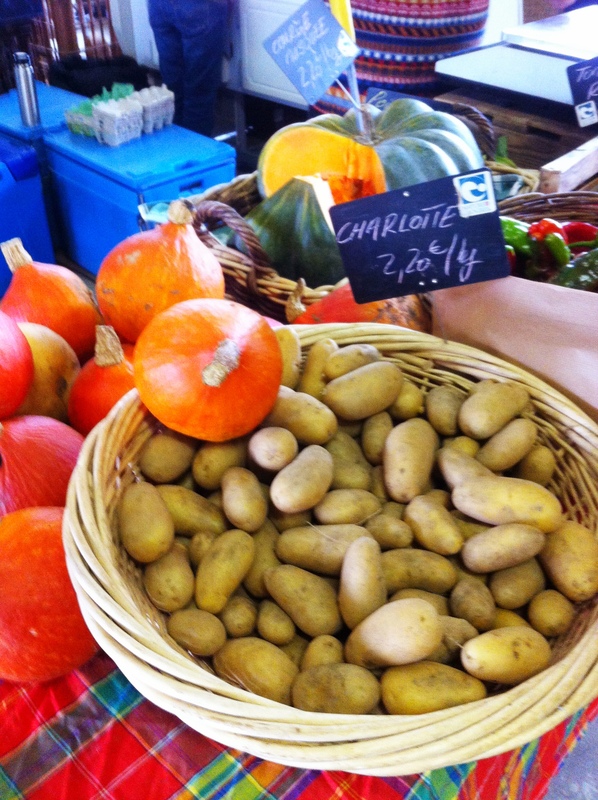 Pomme de terre (potatoes) are found on French dinner tables probably more than any other side dish. So it is no surprise there are bushels and baskets of white and red-skinned potatoes in every market, regardless of the season. Baking potatoes (russet-type) are harder to find in the markets where I’ve ventured. Certainly I haven’t seen Outback Steakhouse giant-sized spuds anywhere. Squashes and pumpkins are now on display in time for fall menus, including creamed soups. The usual way I prepare squashes — like splitting a butternut squash in half and baking it with butter, brown sugar and cinnamon — is unheard of by those I’ve asked. Instead, the squash is peeled and steamed, then mashed. The one I have at my house is going to end up in a creamy, cold soup. One vegetable, pictured in the photo on the right, is a giant radish. According to the vendor, it is eaten raw like its tiny kin. Presumably it’s almost as hot as horseradish. The truth I’ll find out about later. There are not as many varieties of green, leafy vegetables like collards and kale in these markets. But there are many types of veggies like endive, shallots, fennel, and leeks. Eggplant (aubergine) is very popular and prepared in many ways. Mesclun, spinach and other salad greens are in the market throughout the year. Having lived most of my life in the southern states of the US, there are not many vegetables here that I don’t recognize. Some I’m trying for the first time — fennel for example. Yum! Let me share a few shots that were taken on this visit, including one of my friend Andy who came along for the ride. Along with the quaint village streets and scenes, tourists head to Saint Jean du Gard for the steam train ride through the mountainous areas of the Cevennes. 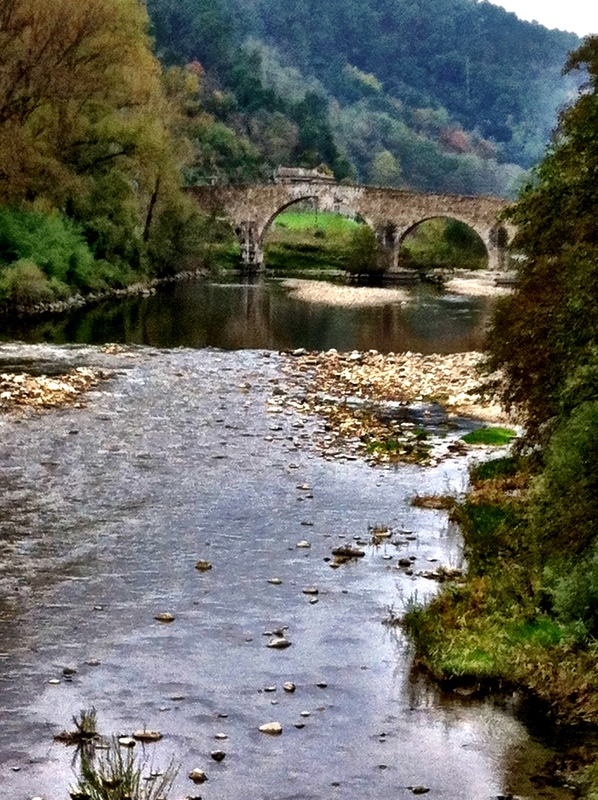 The 45-minute roundtrip to Anduze is on my to-do list for on a sunnier day. Hikers and outdoors travelers head for this part of the Cévennes and the Cévennes National Park in the summertime in droves.The beauty of the hills and river, speckled with small farms and villages, also attract photographers and artists. 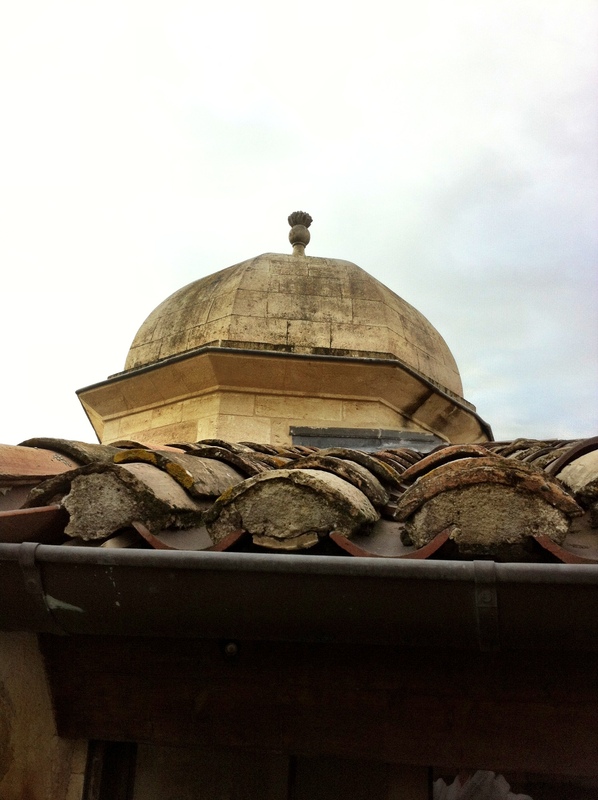 Many sights around the neighborhood in Uzes have been building up in my camera. It’s time to share. 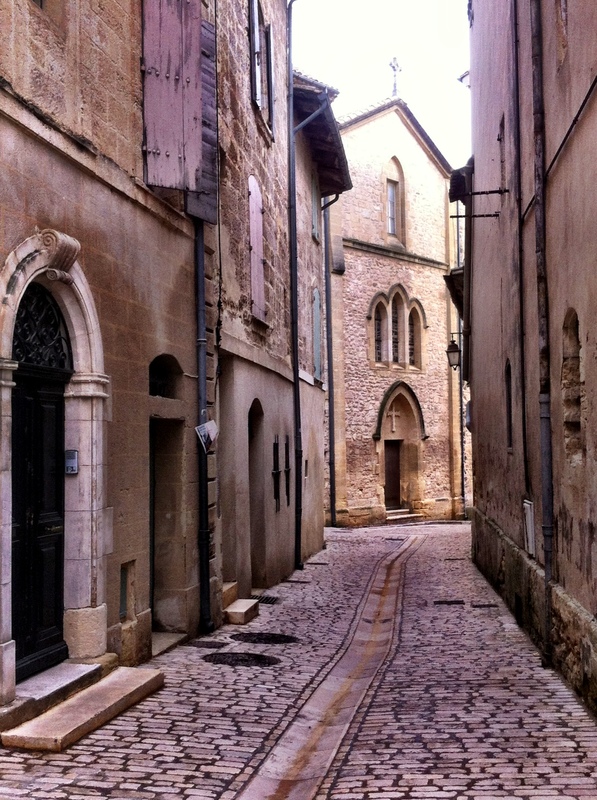 As you would imagine, there are many narrow streets with ancient buildings all around Uzes. From my apartment, heading to the main street, here are just some of the alleyways and sights along the way. Now that there are fewer and fewer tourists in town, some shops are closing, but mostly, people are staying indoors. Cafes and bars along the main street are being taken over by the regular crowd again. 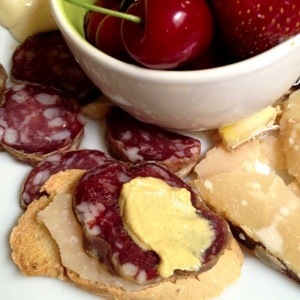 Anytime’s a good time to sit and enjoy a glass of wine, beer, pastis… and a smoke. 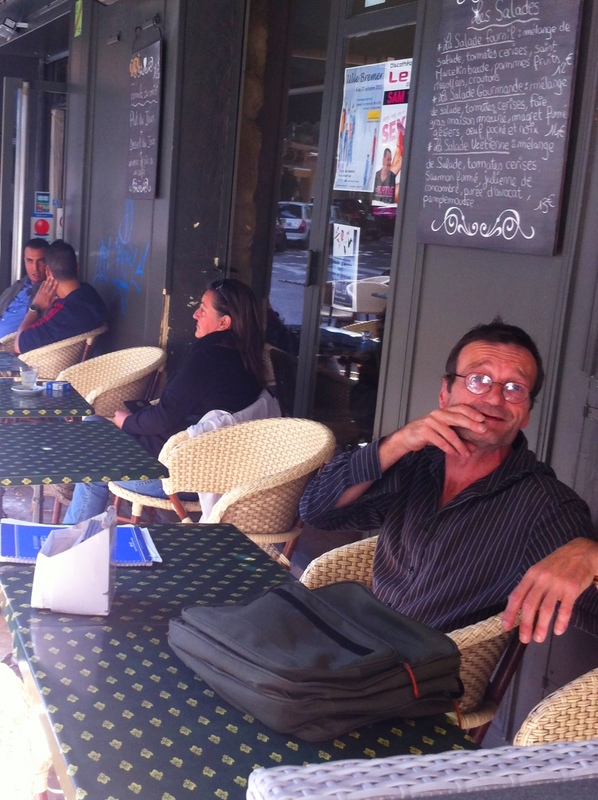 Lots of people in Uzes smoke cigarettes in and out of the bars and restaurants. A popular smoking habit is to roll your own cigarettes from tobacco in cans that is readily available at the neighborhood Tabac stores. Christophe, the bar owner, is learning to speak a little English and loves to joke with me when I show up in the afternoons. 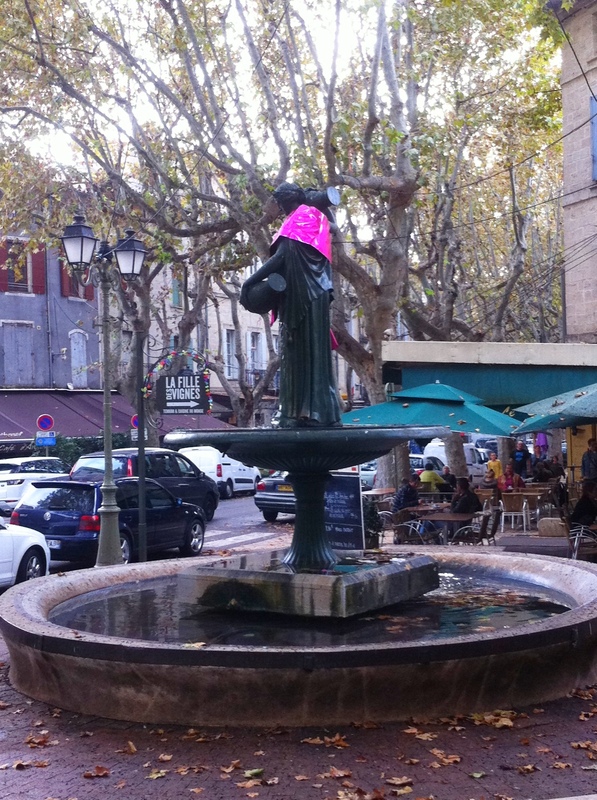 A centerpiece in town is the fountain with the magnificent statue of a maiden pouring water from a pottery vessel. This time of year she is adorned with a pink cape to signify the time for residents to donate to local blood banks. 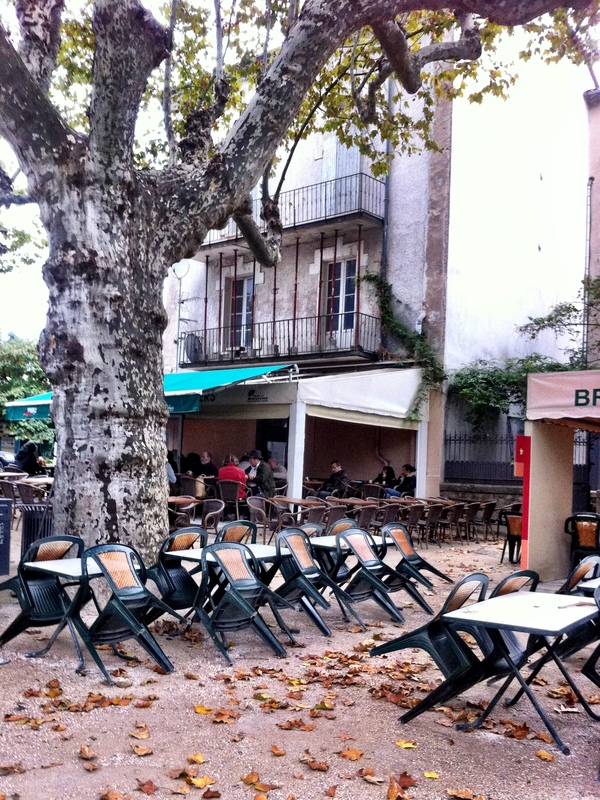 With the crowds gone now, the Place des Herbes is quiet and picturesque in an entirely new way. Even though there are not as many people around, there is almost always live music playing. This last Sunday, a group of musicians joined with friends for lunch and entertained everyone who was within hearing distance. Many of you have asked how I’m getting along living so close to the town’s bell tower. Let’s just say, it’s really close. The bell rings one strike for every hour. Then it rings again five minutes later. Don’t ask me why! Then it rings one strike at the half hour. This goes on everyday from seven in the morning until ten at night. Actually, it doesn’t bother me at all. It’s a pleasant sound. These photos show the view from my apartment if you are standing in my rooftop terrace. The Palace of the Duche is straight ahead, the bell tower to the left, and behind and over the roof is the dome to my own little tower! This is my tower! For real! In my apartment you can walk to what would be the 6th floor and see the inside of the dome. Next time: On the road! To tell the truth, before then, I was close to a meltdown. My lack of French language skills was about to get the best of me. Imagine trying to place a service call to the cable or telephone company if you can’t communicate. There’s no way to get through an automated phone answering systems if you can’t speak French! At the warehouse everything looked orderly and well-managed. Then my boxes were trucked on a fork lift to the door. Having written at least three “catchup” posts which are in various stages of completion, maybe this one will be published before it self-destructs. Remember when I said one of the reasons for moving to another country, out of my comfort zone, was to learn to be patient? Well, my patience is stretched to the limits everyday. Never ask for something unless you really know you want it. Starting with move-in day, photos are far better than words. However, let me set the stage. 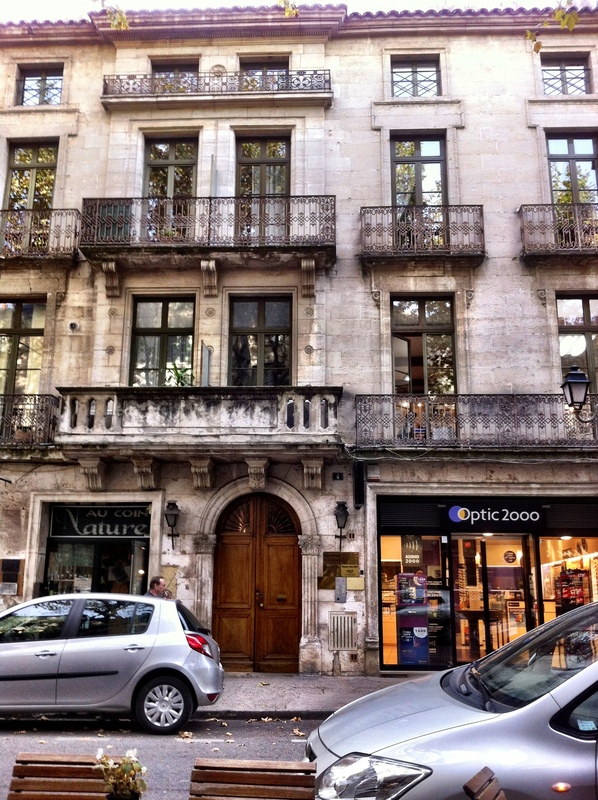 The apartment is in a 15th century building almost in the center of the historic district of Uzes. As most residences here, the ground floor doesn’t count so the floors start on two (etage 2). My apartment is on etage 3. All in all, there are 55 steps from the ground floor. Now imagine “two men and a truck” carrying two 7′ x 5′ armoires; two 4’x3′ Victorian chests (one with a marble top — detachable, thank goodness! ); a 36″ round table; and four chairs up the steps and spiral staircase. The good news? The armoires could be disassembled. Nevertheless! It has been only six days since I landed in France, and I’m almost ready to move into my French apartment! Renting the apartment unfurnished, I knew there would be a lot to do. I thought I’d be doing good if I had a bed and a refrigerator by the first week. That’s before I knew I had engaged the world’s # 1 administrator to help me — Nandine. In less than one week, Nandine has helped find not only a bed, but also furniture for the living room and dining room — along with arranging for telephone and utilities. All that’s left to do is to find furnishings for the guest room, lamps, and accessories.Needless to say, I’m ecstatic! Nandine’s knock on my bedroom door at 8 am, and our everyday trips to either a furniture store, Carrefour, or to Intermarche have gotten the job done in record time. 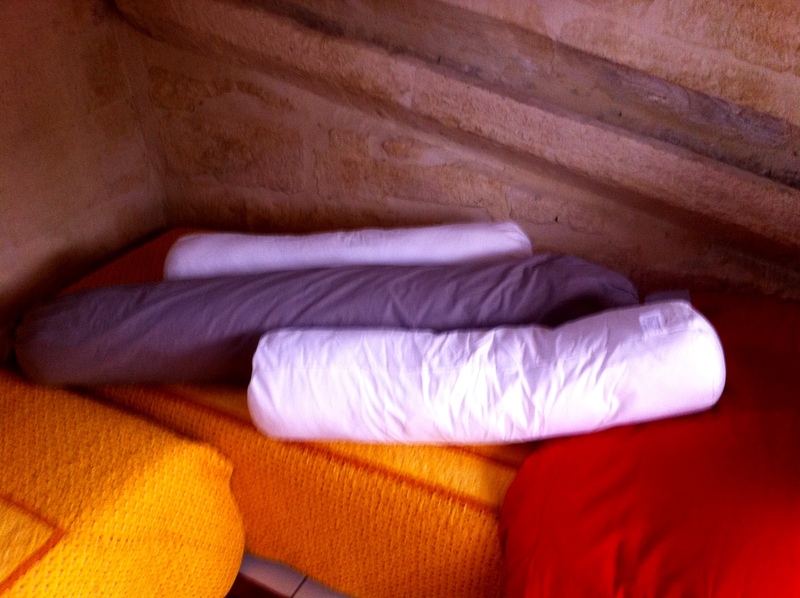 On Tuesday I will wait at the apartment in Uzes for the delivery of furniture and appliances. It should be an interesting day watching the delivery people maneuver the armoires and bed up the narrow spiral staircase. My bet is that most will all be hauled up through the top floor terrace … by ropes. With camera in hand, you’ll experience the pain and triumph with me. All work and no play is really dull. So I’m visiting nearby La Grande Motte. Just outside Montpelier, the resort town on the Mediterranean seems much like Hilton Head Island resort in South Carolina. Condominiums are stacked many stories high, shaped like pyramids, around the boat docks and along the stretch of nearby beaches. Built in the late 1960’s, La Grande Motte has golf courses, tennis courts, pools, lakes, and boat access to the Mediterranean. The commercial area at the yacht basin is busy with restaurants, tourists, and children’s amusement areas. The day I visited there was a race of small catamarans starring world-class yachtsmen. It was truly a beautiful sight when each boat, one after the other, unfurled a different colored sail that fluttered in the clear, blue sky. Living the Dream. 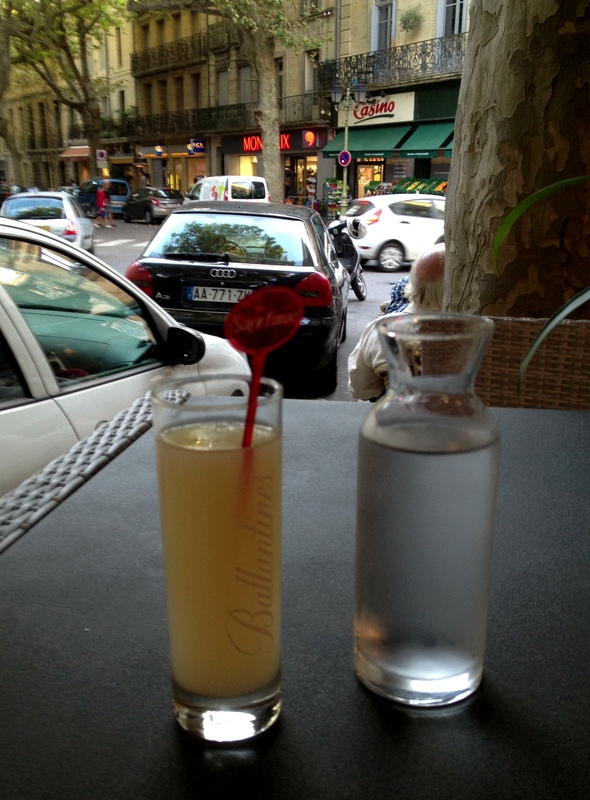 An Expat in France. I’m here! 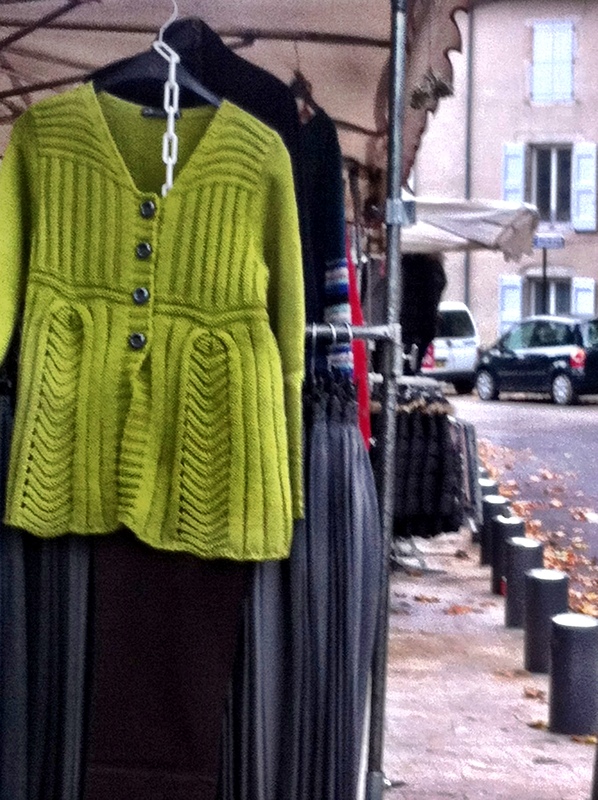 In just two months I’ve transitioned from a starry-eyed optimist to a legal expat in France. I can hardly believe it myself. It took the efforts of my amazing friends and family in the US and in France to make it happen. I will honor your privacy and not call you out by name, however, you know who you are. I am forever grateful for your time, your sweat and muscle, and for your love and encouragement. Truly, I am the luckiest person in the world because of the friends and family that surround me. So… the move started immediately after I returned from France in July. In between, the preparation and paperwork for a long-stay visa and a visit to the French consulate in Atlanta were necessary to keep things rolling along and legal. By mid-August (THE hottest month in the Low Country) my son and friends helped me move everything out of the house in Beaufort. 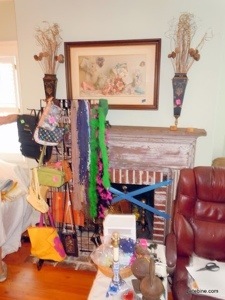 A bit of my most precious belongings went to a small, climate-controlled warehouse space, some to my friends’ homes for safe keeping, some to consignment stores in Beaufort, and lots to my son to sell on eBay. By the time I left Beaufort to say my final goodbyes to sons in Alabama and Atlanta, I was down to ONLY a carful of stuff. Oh…I should say a “rental car” full of stuff. Along the way I was in a wreck and my old, faithful Acura was declared a total lost. Actually, it was great luck. I needed to dump it anyway before my departure to France. With the expert help of my daughter-in-law, who actually throws out refrigerator items according to the expiration dates, I condensed a carful of stuff to one large suitcase, one carry-on suitcase, and a backpack. OK, I must confess. 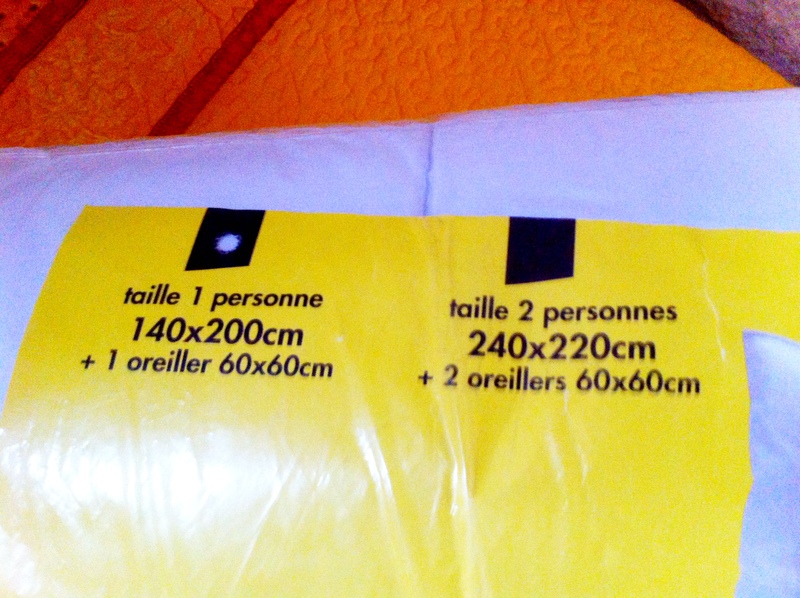 My son is shipping two more 18″x18″x16″ boxes to Uzes. After two months of exhausting work, after imposing on almost everyone I know, after eating every Southern fried food item I could stuff into my mouth, and after a memorable farewell party with friends, I was on my way to my new life in France. This trip I took the route to France through Atlanta, to Toronto, to Paris, to Marseilles. Originally, I planned to take a train from Paris to Nimes. However, as luck would have it, a train strike on the day I was to land in Paris was announced in time for me to change my plans. Instead of the train, I flew from Paris to Marseilles. I’m not certain I would recommend this route because there is a six hour layover in Toronto. However, it did give me time to take a shuttle to the nearby Sheraton for a manicure, pedicure, and a decent meal before the long flight to Paris. On Tuesday, September 10, I arrived in Paris, then Marseilles, France. My move-in goal is Tuesday, September 27. 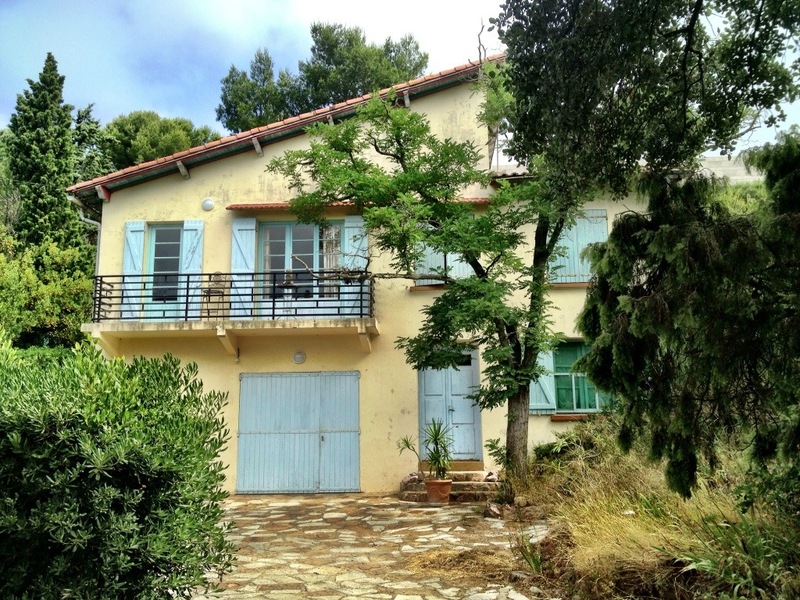 My French Home. I’m an expat in France! Remember when I started this blog, I said the uncharted part of the adventure may be the best. Well, guess what? It may be no surprise to you. I’m going to live it France! 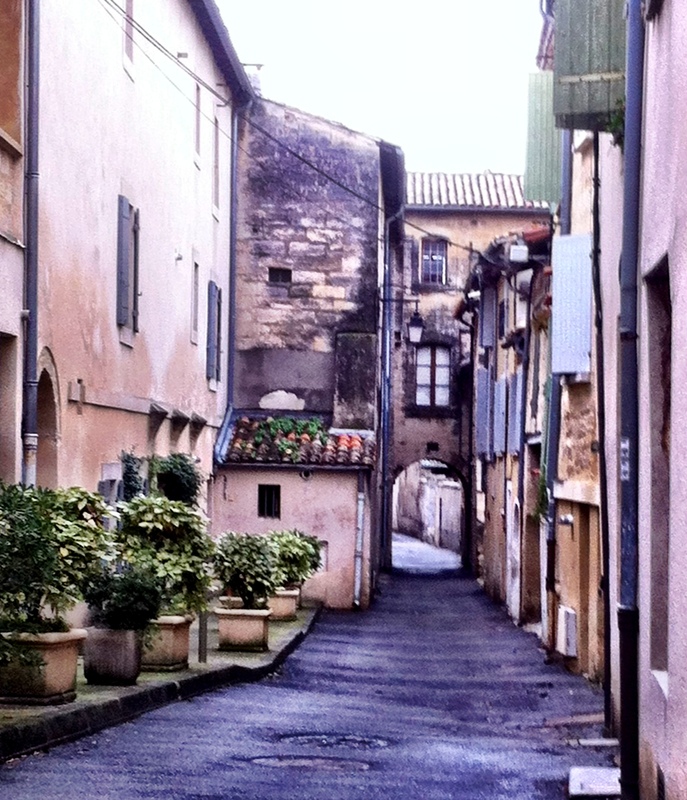 After leaving Sete, I decided I wanted to return to Uzes instead of completing my journey. I needed to find out if living in France was a possibility, not just a fantasy. I would explore the various resources I had for finding apartments, for example. My friends, Geoffrey and Nandine, offered me a place to stay in their home until I could sort out my arrangements. As fate would have it, everything began to fall into place. The rental agency notified me that an apartment was available they thought would be ideal for me. Ideal? It’s magnificent! 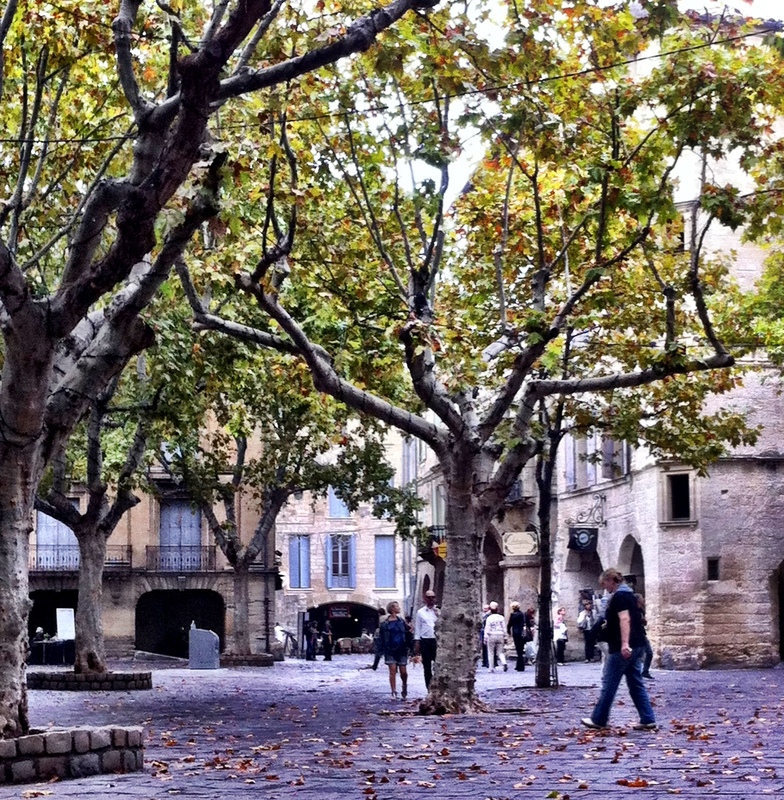 It’s right in the center of the historic district in Uzes, Place du Duché. Better yet, the rent is far more affordable than I could imagine. Less than my housing cost in the US! Now I’m back in South Carolina making plans to move to France! 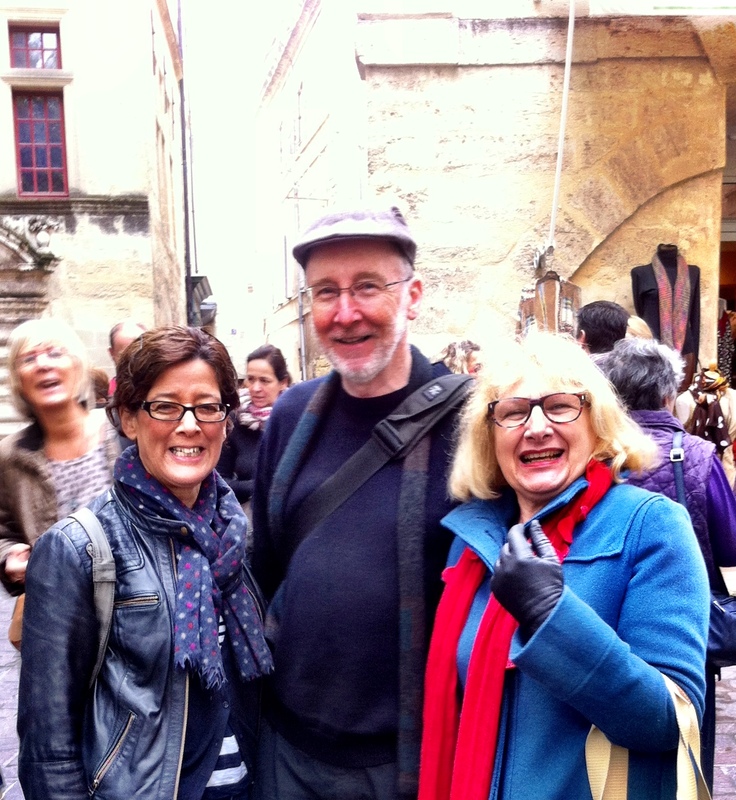 There’s much more I have to write about my six week adventure — like visiting Pezenas, France, more jewelry artists and fascinating people along the way. Then, there’s always charting the progress of a lone female moving from the US to France. Stay tuned! Sete is a party city. There’s a celebration of some sort going on all summer. Sometimes two at a time. Right now there’s a music festival that features famous DJs from around the world. There’s also the festival of St. Peter happening downtown with its parades and fair-like atmosphere. 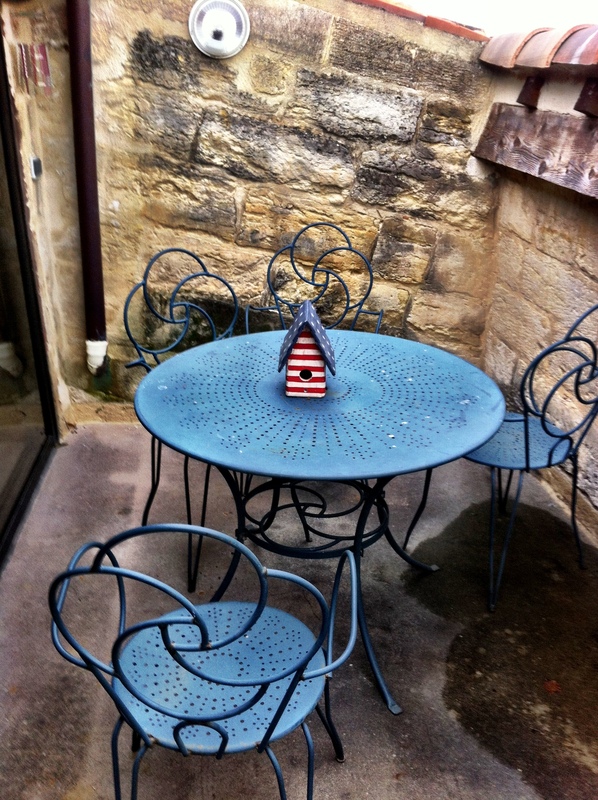 Lucky for me, the Fourth of July is celebrated here by English-speaking expats. Nancy, my Airbnb hostess, invited me to a party to meet some of the members of the expat club who have settled around this area from England, Scotland, Ireland, Australia, and the US. 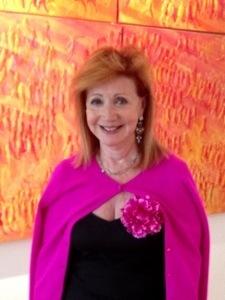 Christina Rabaste, an American who has lived in France most of her adult life, hosted the party at her home in downtown Sete. The interesting, multi-level house is a combination art studio, indoor garden, patio and home. The party was held in the first floor, inside garden of Christina’s home where some of her life size “statues” were standing among the red, white and blue decorations. Her studio was open for guests to visit, and dining tables with chairs were placed around the large room. When I strolled into the studio, I fell in love with her whimsical paintings and sculptures. Not only was there a collection of her art on canvas, she also had painted her odd characters on pieces of wood and old chairs. Perhaps there’s a Michelangelo hiding deep down inside of me, because I have a great affinity for artists. Maybe it’s because they express themselves so openly. They are fascinating people to know. When not partying, people in Sete hit the beach in droves. Outside the city, beyond the seawall and rocky shore, a long beach stretches for miles along the Mediterranean. Closest to the city, the beach is mobbed with people who, mostly, are standing waist deep in the water. Farther down the long road that heads out of town, the crowds thin out and beach lovers go to the “mini-resorts” that are spaced every half-mile or so along the shoreline. The mini-resorts are run by restaurant owners from Sete and from the surrounding areas who lease space on the beach during the summer. Each place has dining service, beach chairs, umbrellas, etc. For a small fee (10 Euros), you can rent an umbrella and chair for the day. 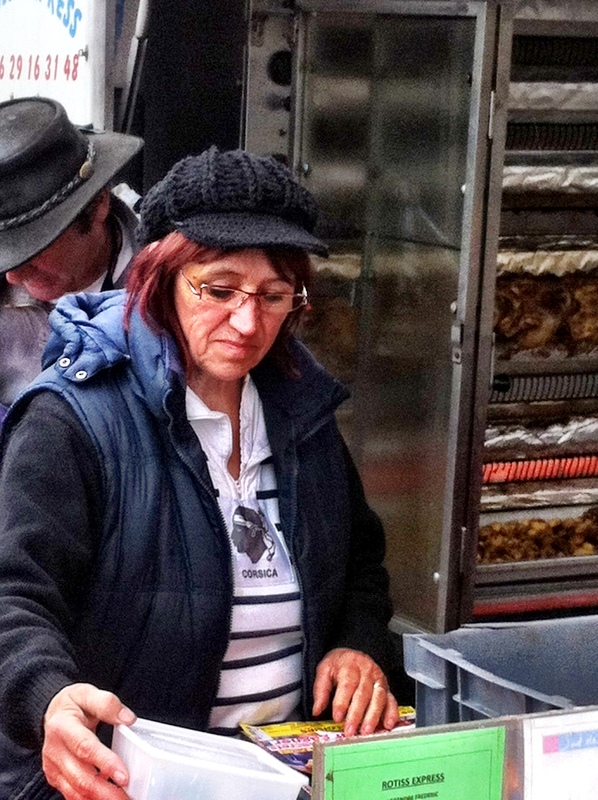 Food can be purchased and is prepared fresh in the beach-side kitchens and served at a table or on the beach. 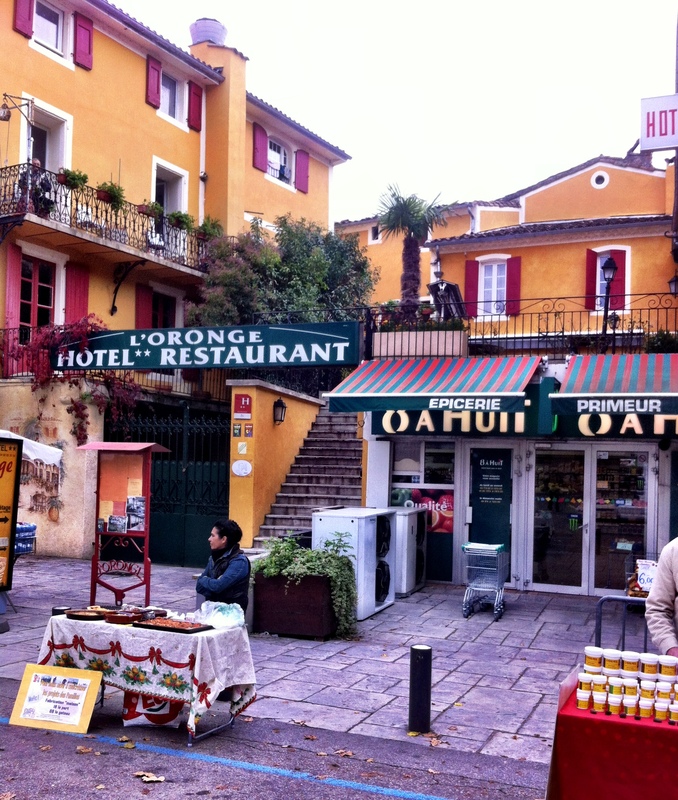 Now that you have a small glimpse of Sete, let me tell you about the places I’ve stayed and new friends along the way. 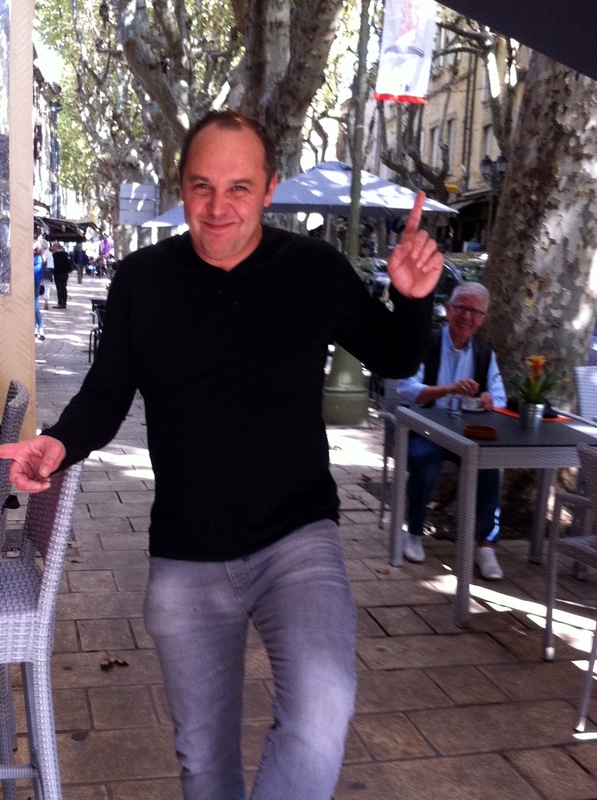 Ales (borrowed Citroen) and I arrived in Sete Saturday afternoon. (See earlier post.) We rushed to get to the apartment I reserved through Airbnb because my hostess, Nancy, was heading for a wedding in Provence. Nancy welcomed me to her beautiful home, showed me around, gave brief instructions about feeding the two cats, then she was off. I had the place to myself until late Sunday. After unloading my bags into the bedroom, I walked downstairs, out of the apartment building that faces the Grand Canal, and then into the Petite Carrefour store a few doors down the street. I grabbed a Coke Zero, a bottle of water, wine, beer, and a prepared tuna sandwich. In other words, I bought everything I needed to settle in for awhile. Did I mention the wind was howling all this time, even though it was a gorgeous, sunny afternoon? Happily, I spent the rest of the day stretched out on the living room sofa, enjoying the apartment and the unforgettable view of the canal through the open French doors. Early to bed, early to rise, Sunday I put on my comfortable walking shoes and set out to explore the town. I walked from the apartment, up the main canal, to the seawall that was probably a mile away. With the canal on the left, the right side of the street is lined with small shops and cafes. About half way down the street, the one-way roadway divides in two with one side going up a slight incline into the center city. The left side of the road heads downhill close to the canal, then uphill to join the other street again. 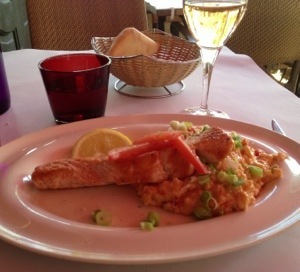 The right side of the canal street is lined with one small seafood restaurant after another. In fact there are so many restaurants in a row that you are tempted to believe they must have only one kitchen. The menus are basically the same in each restaurant: Moules (mussels) and fries, oysters, fish soup, Bouillabaisse (a traditional fish stew originating Marseille), tuna, more fish, and a specialty of Sete — tielle, a tart filled with a tomato-y mix of octopus and spices. I ended up choosing a restaurant near the seawall that was serving a whole grilled fish with tielle as a first course. The family-owned business was tended by the father, wife, son and son’s girlfriend who all spoke English. I knew in advance that I was leaving Nancy’s apartment because it was booked due to a worldwide music festival. Generously, Nancy had arranged with a friend, Genevieve, for me to stay in her guesthouse in St. Clare, overlooking the Mediterranean. Genevieve drove to Sete to lead me to her home in St. Clare. When we arrived at her hillside home, we sat on the veranda and began chatting like old friends. Her English is perfect since she’s been an English teacher for years. Her son, Alexander, is home for the summer break from University so we enjoyed getting acquainted. He is in his fourth year studying pharmacy. After visiting for awhile, the neighbor from next door appeared at the garden wall. She invited us to her home for aperitifs at 7pm. (Drinks/cocktails) She and her husband have a home in Paris. They are here at their “beach house” entertaining their grandchildren and guests. Soon, Nancy arrived to pick me up for our tour of a wine domaine and a twelfth century abbey. Nancy runs a tour company in addition to her Airbnb business. She is entertaining clients from Canada over the weekend and invited me to go with her to preview her tour. She likes to make certain that everything runs like clockwork for her clients. Needless to say, I was delighted to join her. The Abbey de Valmagne is just outside Sete and welcomes nearly 35,000 visitors yearly to admire the cloister, its fountain and gardens, Gothic church, chapter house, and monastic outbuildings. The illustrious history of the abbey includes the story of an Abbot who, during the Reformation, turned against the church to save his own life. He led an army of Protestants to raid the Abbey and kill his fellow priests and parishioners. For centuries the Abbey has operated a wine domaine which exists today. Huge wine vats are prominent features in the alcoves of the church itself. In addition to the winery, the Abbey is a popular tourist destination for the wine tours and a gourmet restaurant that are on the property. Not far from the Abbey is the second stop on Nancy’s tour: the wine Domaine Saint Hilaire and luxurious B&B run by the domaine owners. Returning to Genevieve’s just in time for aperitifs with the neighbors, I experienced my first social occasion that was all spoken in French. It’s amazing how well you can get along understanding a few words and body language. Note: Genevieve’s son, Alexander, has an interesting hobby. He and his friends participate in “re-enactments.” I have some Americans friends who enjoy the Civil War and Revolutionary War faux battles. Alexander is a gladiator! His team has “fought” in the Arena in Nimes. So much to do. So little time. My adventure is already into week four. If I think about it like the glass of water that is “half full or half empty”, the last half will be the best! Today I arrived in Sete, France. But before I get to that, we have some catching up to do. The last couple of days I’ve been hanging out with my new friends and not spending as much time being a tourist. 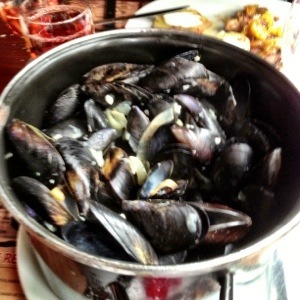 The steaming pot of moules (mussels) saved the day. Geoffrey had prepared lamb shoulder for dinner, so I followed them home to enjoy Geoffrey’s amazing culinary skills. After a few too many glasses of wine, our inane imaginations got away from us. Friday came much too soon after a late dinner with Nandine and Geoffrey. Fortunately I’d dedicated the day to washing clothes and preparing for my departure from my three weeks stay at the apartment in Uzes. Unity and Tom had invited me to join them and some close friends for dinner at their home outside Uzes. Amazingly, I found their village and got close to their house all by myself. Tom talked me in the rest of the way over the cellphone. The evening flew by with each of us sharing stories about our lives in Scotland, England and the US. Today I started out to Sete later than I had hoped because I couldn’t find Ales. 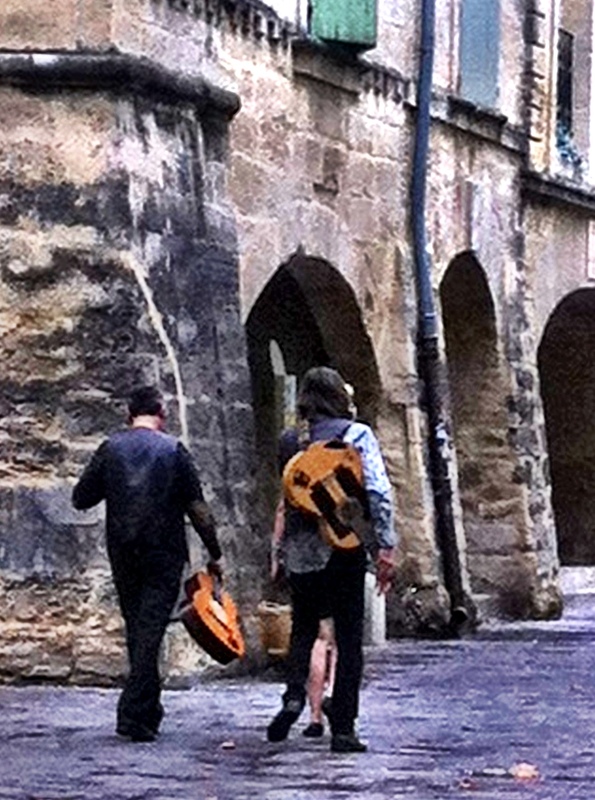 When I arrived back in Uzes after dinner with Unity, it was around 11 pm. The parking lot where Ales lives was closed. Fortunately, I remembered another lot nearby, so I left her there. To be honest, I was pleased with myself for finding the parking space because it was close to my apartment. I could easily get my luggage to the car the next day. I got up early this morning to meet Geoffrey so that we could go to the market together. He wanted to introduce me to his favorite hat man so I could buy a Panama hat like Nandeen’s (the one I wore in the picture above). Before going to Geoffrey’s house, I thought I should check on Ales and make sure she was ok. I walked the few blocks to the parking lot where I left her the night before. When I got there… no Ales! Aaccch! I panicked! Was she stolen Hauled away? Where was she? What was I going to tell Geoffrey? I’d have to go straight to Geoffrey’s and confess Ales was gone. 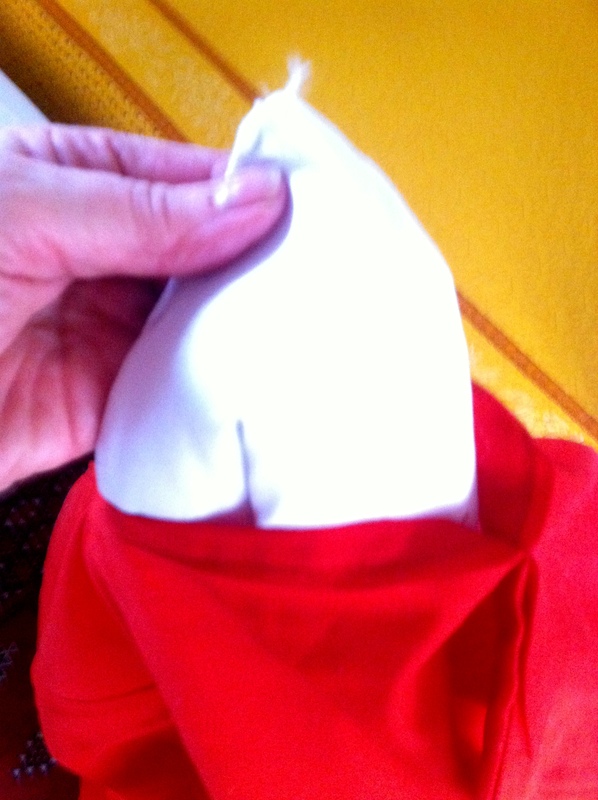 When I arrived at Geoffrey’s, I knocked on the door and Nandine let me in. “Geoffrey’s upstairs,” she said in French. I walked up the narrow, winding, stone stairwell feeling like I was going to the French inquisition. He then explained, one of his friends called during the night and wanted to borrow Ales. His car had been vandalized in the village where he lives and he needed a car the next morning to get to work. Knowing that I had taken Ales that evening and that I always returned her to the garage, Geoffrey told his friend to meet him at the garage. They searched all three levels of the garage and didn’t find Ales. They searched all over town before they found her. I’m now spread out on the sofa in the living room of my home for the next two days. It is a beautifully appointed, grand apartment in the center of Sete, facing one of the major canals in the city. Two double French doors are open onto a balcony decorated with ornate iron rails. There’s a lovely cool breeze. One of two Siamese cats is perched on the chair opposite the sofa, staring at me. It’s been a long day, starting with Ales’ disappearance and eventual discovery. The drive to Sete, while only a couple of hours, was grueling. It was my first venture on a “super highway.” Ales’ speedometer is broken, so I have no idea how fast I was going. Probably not fast enough. Cars were whizzing past. I dared not turn on the air conditioner. Ales was putting out as much effort as she could just trying to keep up with traffic. Here’s an interesting tidbit about French toll roads — or at least on this particular six-lane highway. Three lanes of southbound traffic enter a toll station with 15 ticket booths. Traffic moves pretty quickly through the booths, right? That’s good. However, know what happens when those cars and trucks in the fifteen booths converge up the road back into three lanes? A massive pileup. Go figure. Stay tuned. 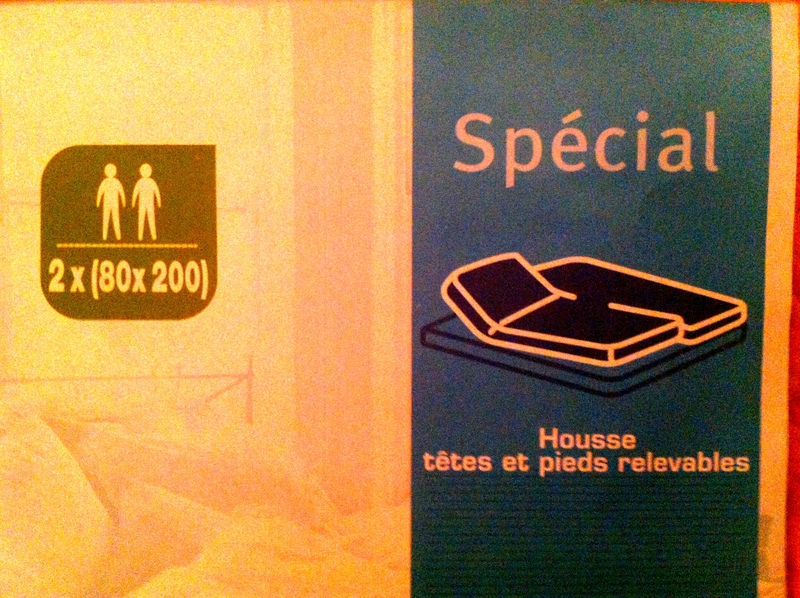 Tomorrow we explore Sete. 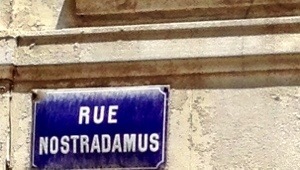 Visiting Nimes took me back to Miss Clegg’s Latin class in high school. Some of you reading this story remember Miss Clegg. Or you had a teacher like Miss Clegg. She never knew that I had English translations of Homer’s Iliad and the Odyssey and Virgil’si Aeneid, loaned to me by my beloved Aunt Edna. I still have nightmares that Miss Clegg discovers my secret and I get an “F” in Latin and I never graduate from high school. 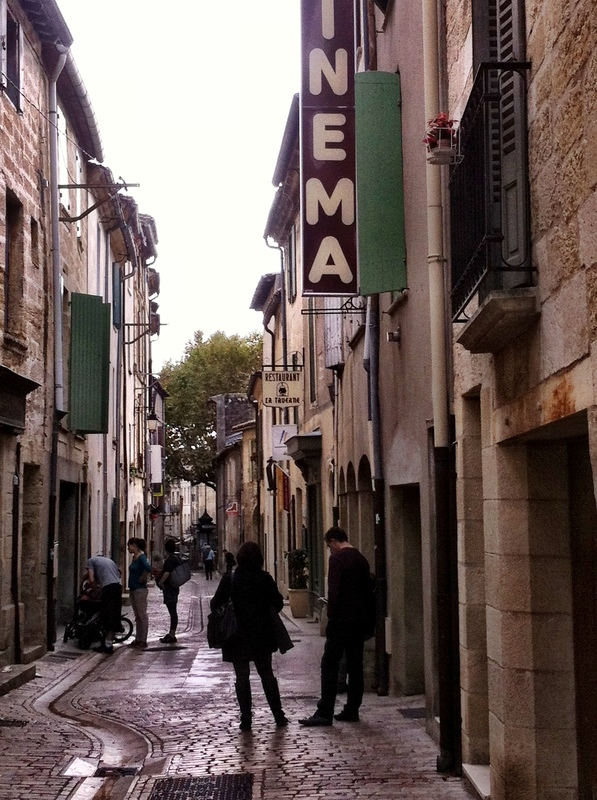 Nimes (pronounced “Neem”) dates back to the first century BC and was named for the Celtic God Nemasus. It was created as a Roman colony by Julius Caesar who gave land in Nimes to his soldiers after they served 15 years in the army, During the rule of Augustus, Nimes was a prosperous city and boasted a population of 60,000 citizens. Mighty structures such as the aqueduct Pont du Gard were built to serve Nimes (see earlier post on Pont du Gard), and a regal temple was erected, Maison Carrée, to honor the Roman Gods. Another landmark is the Amphitheater that dates back to the 2nd century BC.. Both the Amphitheater and Maison Carrée are in a huge area in the center of town that is designated as a historic district. The sides of the district are bounded by four boulevards. It takes about 25 minutes to walk the circumstance of the area– if you don’t stop. I bought the Gran Tour ticket to visit 3 sites for 11 euro ($14.50). It included an self-guided audio tour of the Amphitheater (or Arena), a 3D video in Maison Carrée, and entry to The Tour Magne for a panoramic view of the city. Today it is one of the most well preserved temples from the Roman Empire to be found anywhere. The Amphitheater, also called the Arena, is one of the ten best preserved Roman arenas in the world. Currently it is being renovated, but even now, the space is being used for public events. A stage was being erected while I was there for an upcoming rock concert. The Arena accomodates up to 25,000 people. An audio guide was available and it was quite worthwhile. You can walk into the arena, sit in the stands, and relive stories of gladiators and lion slayers. 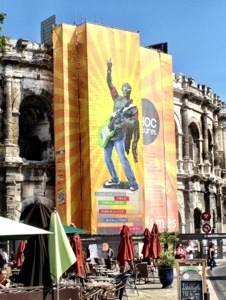 The Tour Magne stands on the highest spot in Nimes and can be seen for miles around. It is all that remains of the Wall that surrounded the city built by Augustus. To take full advantage of my Gran Tour ticket, I walked to the top of the hill, then up the spiral staircase to the top of Tour Magne. It’s one of those things I can cross off my list and say, “Whew!! Don’t have to do that again!” The view was amazing. The walk? Let’s just say that’s why I ate pizza when I returned to Uzes. I earned it! One of the most enjoyable parts of the walk to the top of Tour Magne is that to get there, you walk through the Jardins de la Fontaine, considered by many the most beautiful gardens in the world. As I was on the path up the hills winding through the garden, I thought to myself how wonderful it must be to live near such a place. The people of Nimes and visitors were out by the hundreds today, enjoying the perfect weather and well-maintained property. Like other tourists areas I’ve seen on my trip, the place was immaculate– from the trimmed shrubbery to the stone stairways. 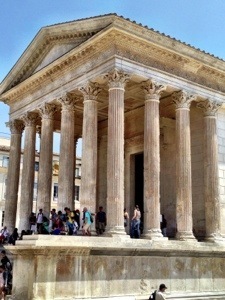 One of my most striking impressions of Nimes is how two worlds — the ancient and modern– are coexisting in such harmony. The rock poster on the Amphitheater says it all. 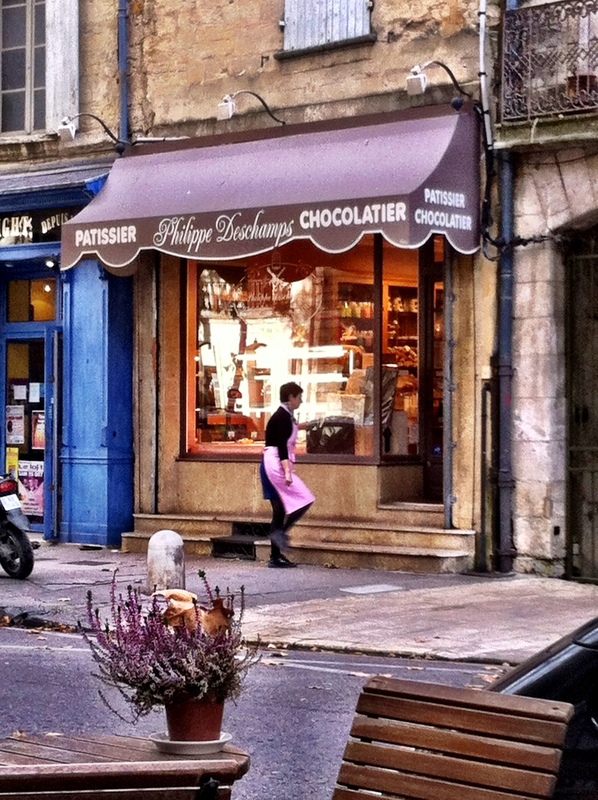 If you’re planning a visit to Uzes, be sure to make it over a weekend. 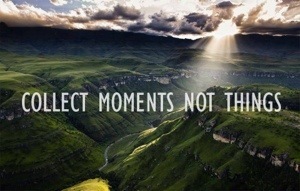 There’s always something special going on. 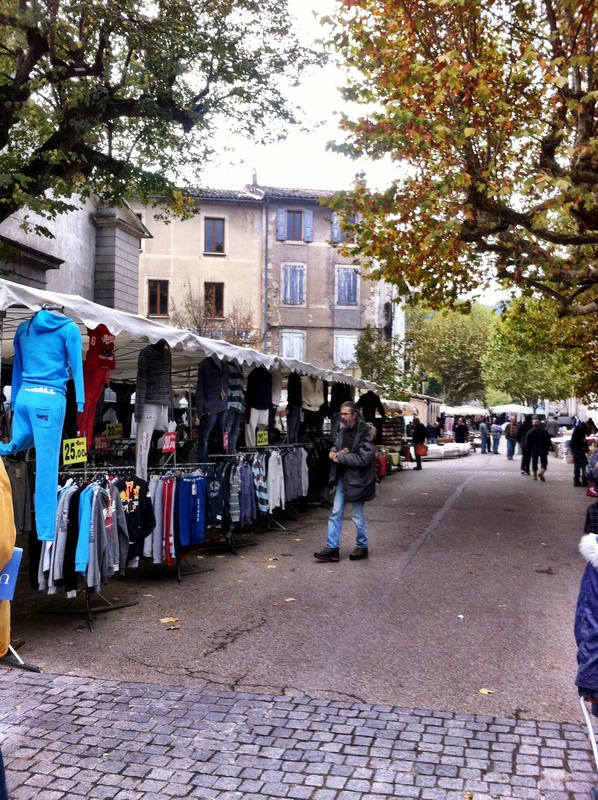 Saturday Market is a day-long experience in itself with all the vendors and food stalls. If that’s not enough, there’s a French version of American jazz. 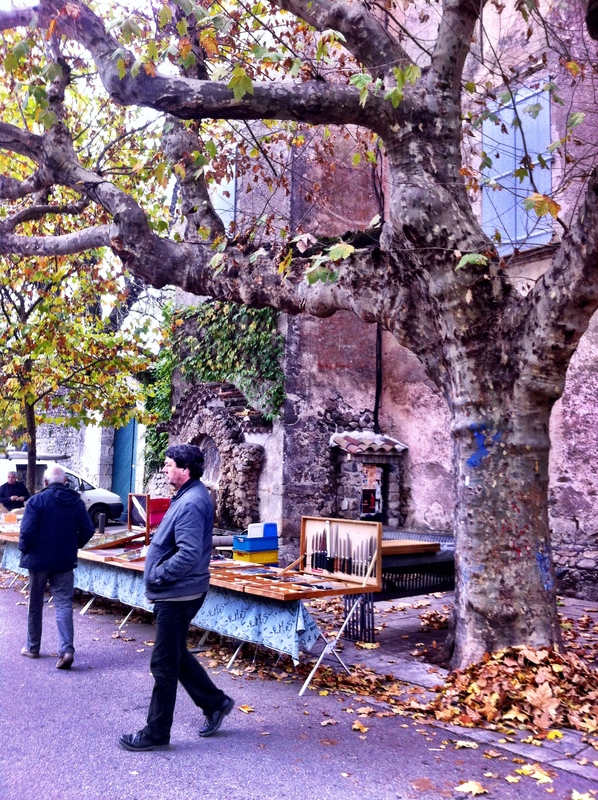 On Sundays, when you think the town should be ready to slow down, you’ll often run into a special art or music event in Place Aux Herbes. On this day … jewelry!! Leather and glass, linen and beads. 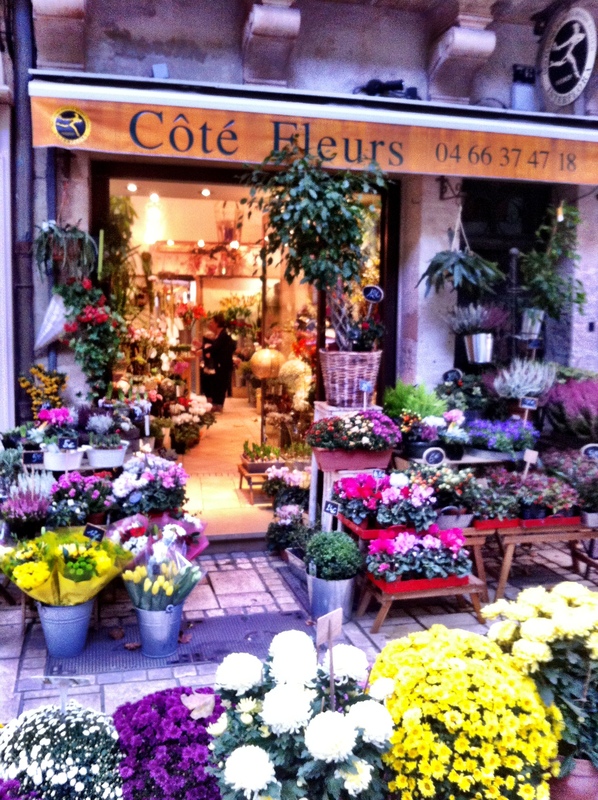 For the kids and families, Uzes throws a colorful, fun-filled, French-style carnival. Good eats are everywhere, including one of the French favorites, Andouillette — a flavorful sausage made with pork parts you don’t want to know. Wish you were here? Listen and see the Sunday sights and sounds. There’s an old song with the lyrics “it’s a fine friendship, but no romance.” Or something like that. Maybe I’m making it up, because Google’s never heard of it. 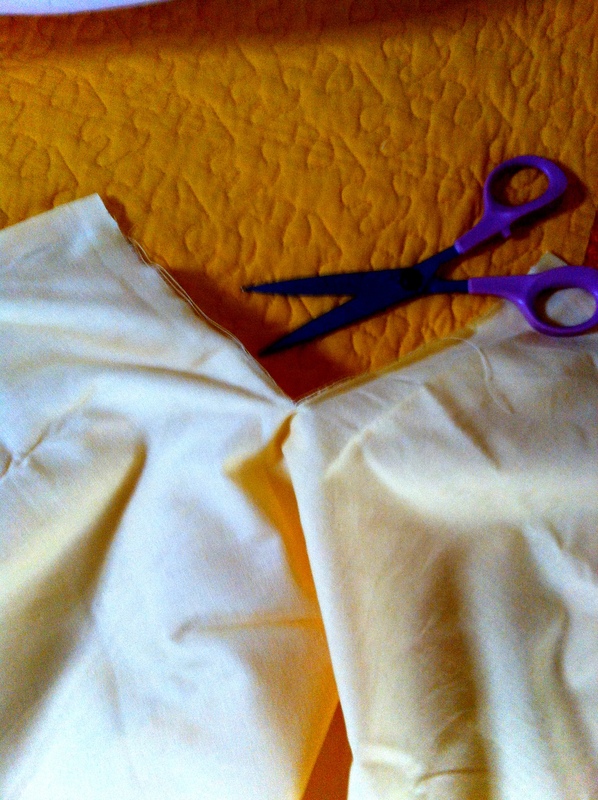 Nevertheless, it’s a good title for today’s blog. You see, every time I say I’ve met a new male friend, my good buddies who read the blog get the idea there it must be a budding romance. 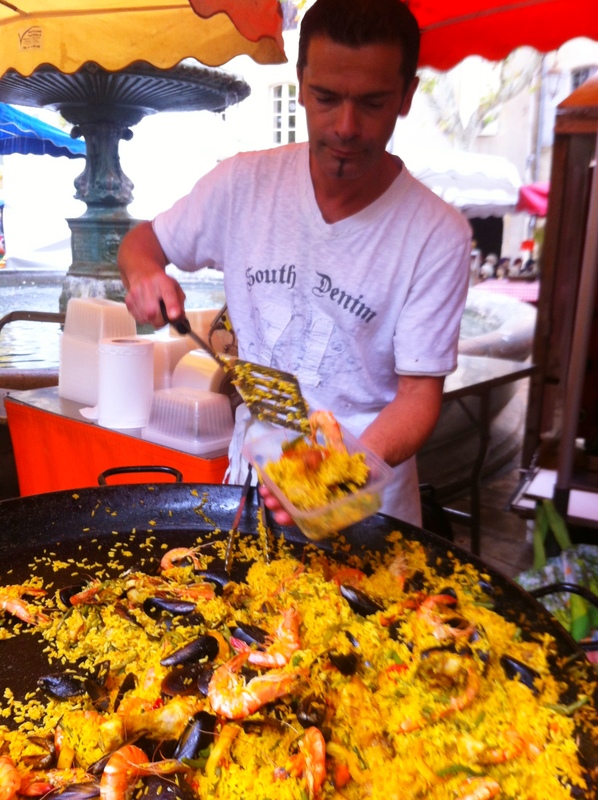 This 6-week adventure to France and Spain is not intended to be a take off on “Eat, Pray, Love.” There’s been plenty of eating … and more to come. There’s been very little praying… although that’s bound to change tomorrow when I get out on the highway for the first time by myself. And love? My hope, as trite as it sounds, is to learn to love myself. There’s a quote in Kathryn Stockett’s book and movie, “The Help” that I want badly to internalize: “You is kind. You is smart. You is important.” On this journey where I know no one, I don’t speak the language, and …I have a terrible sense of direction, I’m learning more and more to like myself. Now, back to food. As you may recall, today was the appointed day to drive with Geoffrey to the nearby town of Nimes. 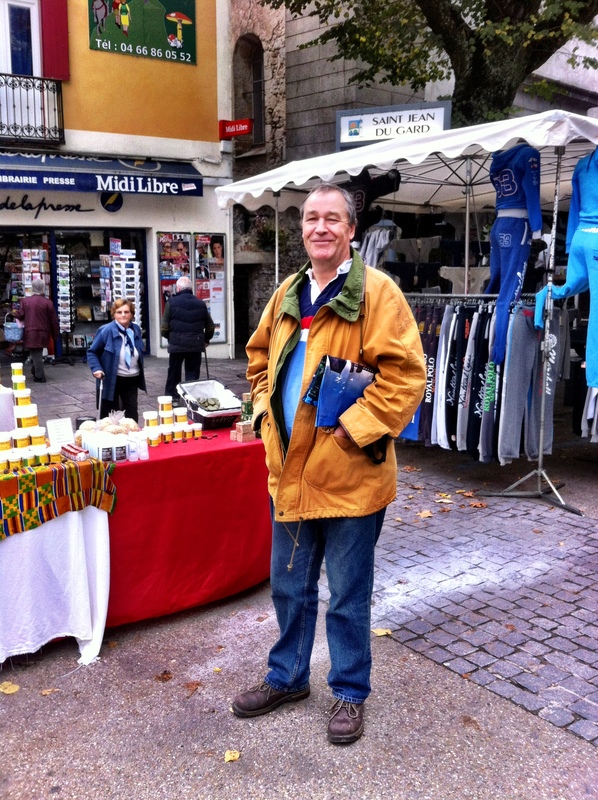 Our main purpose was to visit the indoor market and to have lunch at one of his favorite cafes. He drove his well-worn Citroen and gave me driving lessons along the way since I was to drive back. In France, cars entering a roadway from the right have the right-of-way. That means you have to watch very carefully because someone may pull out from dome obscure side road and sideswipe you. We arrived at the indoor marketplace which is located just outside the center of Nimes. It is attached to a multi-level, modern, shopping mall and parking garage. The area surrounding the shopping complex looks a lot like many other commercial, downtown areas in the world with busy, narrow streets. The market was closing since it was close to noon, so we stopped off for a quick flute of champagne at one bar, then onto Dejeuner at Le Patio Littre. The afternoon’s chatter and stories from Geoffrey are in my head waiting to be spilled out into another day’s blog. Stay tuned. Geoffrey’s loaned me his clunker car ’til Wednesday. 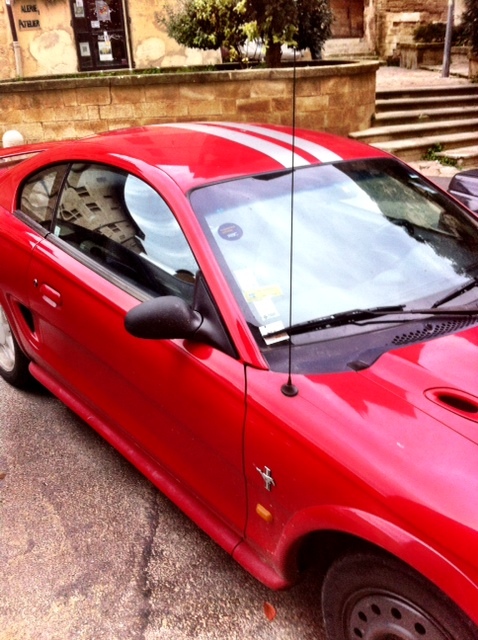 then i get his red Mustang with racing stripes. And to the story here? There is none. Geoffrey is happily engaged to a long time girlfriend. Nevertheless, we’re looking forward to enjoying a fine friendship. For years I’ve wondered if I should be called “Deborah”, not ” Debby”. It seems like “Deborah” is a name more fitting to my age. Now that I’m in Franc e, I think I will switch. The French don’t get “Debby”. They say: “DeeDee” or “BeeBee.” Also, taking a new name when I’m trying to “hide out ” among the locals seems appropriate. “Hide out” is a joke, of course. At 5’10” tall and with blonde hair, I hardly look French. 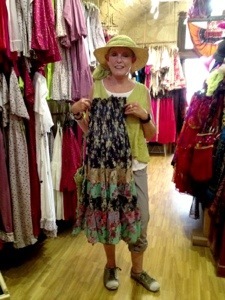 Plus, the new clothes I’ve fallen for — all ruffles and flowers–are definitely tourist duds. In spite of looking and acting like a tourist, I’ve begun to make friends here. Mostly, because I was fortunate to meet one very special and talented lady, Unity. I met her a few days ago at the “popup” gallery on the main avenue of town where she is exhibiting her artwork. We hit it off immediately. Since meeting Unity, I have been introduced to several of her friends, mostly British ex-pats like Unity and her husband, Tom. One of the new acquaintances, in particular, has made quite an impression on me. The most eccentric “Geoffrey”. The first time I met Geoffrey was at Unity’s gallery. 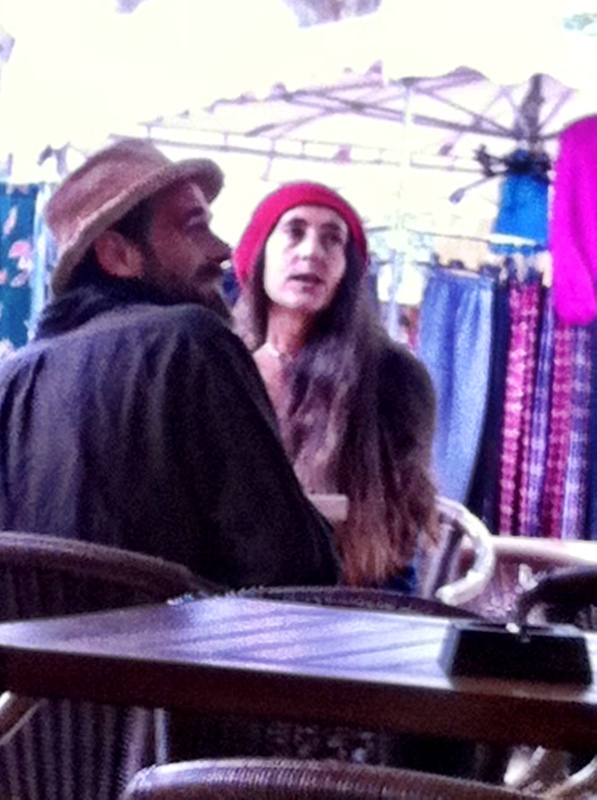 He was wearing an extremely broad, black beret. Even though it was close to 90 degrees in the shade that day, he also had on a black suit, black vest and tie, and a crisp white shirt. Around his neck, huge headphones were hanging down, tuned to Led Zeppelin, he said. We didn’t strike up a conversation that day, but we ran into each other the next day, again at Unity’s. 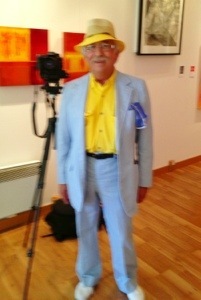 This time he was decked out in a dapper pinstriped suit and a canary yellow shirt and yellow straw hat. He said he has over 60 hats. I’ll have to admit, I was enthralled with his flamboyance. That day Geoffrey, Unity and I had time to chat a bit. Soon we were carrying on like old friends. The conversation came around to their suggesting places I should visit during the rest of my stay in the south of France. Geoffrey offered to let me drive his car to nearby Nimes where he would give me a guided tour of the city. The invitation seemed perfectly ok and safe to me, especially because of his friendship with Unity. He then invited me to join him on a short walk from the art gallery to his home so that he could check his schedule. I said “yes” knowing that Unity was expecting us both back at the gallery shortly. Geoffrey had committed to taking photos of her paintings. So off we went, down the wide, stoned-paved alleyway to Geoffrey’s house. it was less than two blocks away. When we arrived at his four-story stone house, Geoffrey stopped to point out the posters that were plastered on both sides of the front door. He explained he had put them there as a ruse. The place was supposed to look abandoned, or lived in by gangs, “to ward off intruders,” he said. It sort-of worked. It did look unpretentious. But then he opened the door. I was first surprised, then amused. I had walked into Goldielocks’ cottage! The front room was a big kitchen with a large table, chairs and big wooden hutch with glass doors. Inside the hutch and hanging on almost every inch of the walls was one of the most delightful and collectible assortments of pottery and china I had ever seen– outside of an antique shop. It was then I learned where this interesting person had come from. Geoffrey is a retired professor from Oxford. His specialty was pottery and ceramic arts. I almost melted in my tracks. Pottery and china collecting is my passion. 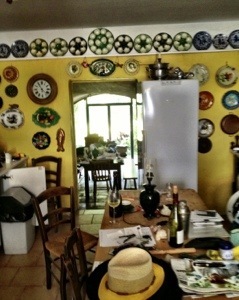 For nearly an hour I toured through Geoffrey’s home, viewing his life’s collection of art and ceramics. 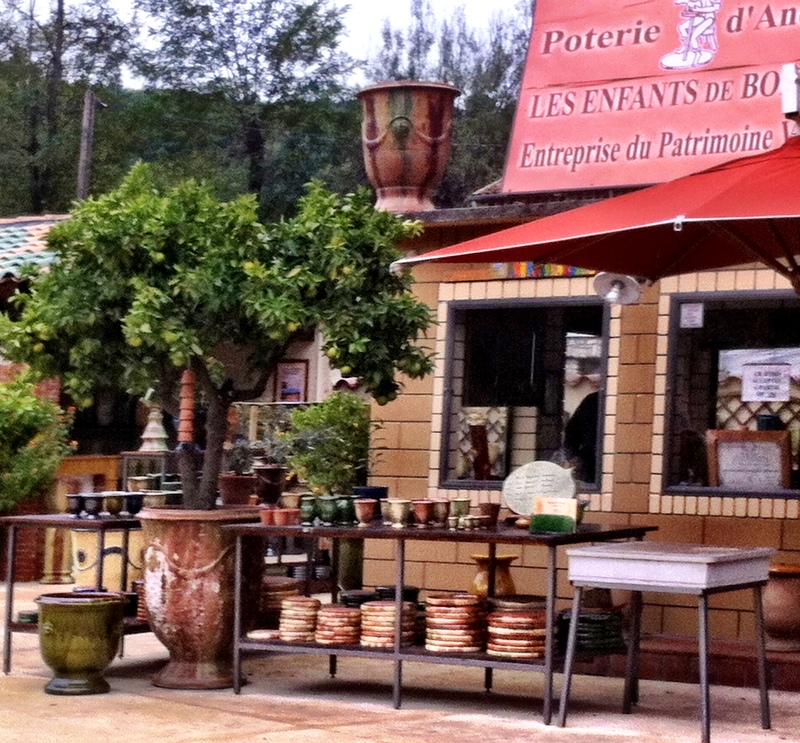 He showed me rare platters made from a unique type of clay found only near Uzes. I saw magnificent majolica pieces and early flow blue china. Some of his most prized possessions are family pictures, including one photo that particularly struck me. 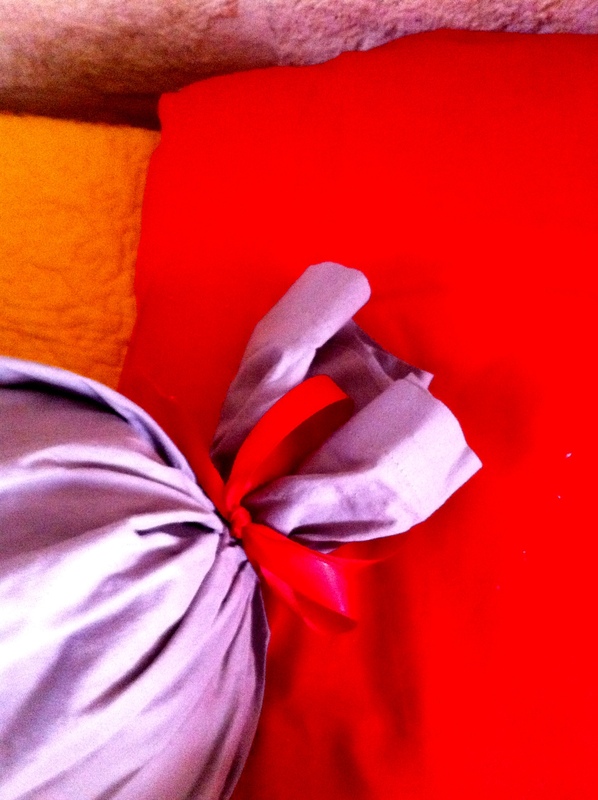 It was a picture of his grandmother — a showgirl in the early 1900’s — dressed in her show business finery. i knew at once where Geoffrey got his flair. But wait… it gets better than that. Geoffrey’s grandmother married a circus lion tamer. Now, that’s a story I’ve got to dig into.